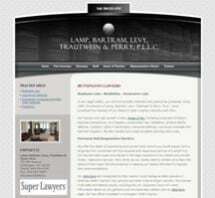 Founded in 1989, Lamp Bartram Levy Trautwein & Perry, PLLC focus on serving clients' needs in West Virginia, Kentucky and Ohio from its centralized office in Huntington, West Virginia. Awarded the prestigious AV Peer Review Rating from Martindale-Hubbell, the firm concentrates its practices in the areas of general civil litigation, corporate and transactional work, as well as estate planning and trusts. Lamp Bartram Levy Trautwein & Perry, PLLC also offers alternative dispute resolution options for parties, including mediation and arbitration services. The firm prides itself in providing personalized and diligent legal representation for its clients, seeking to offer the most effective legal services and counsel to assist those clients in navigating the legal arena.